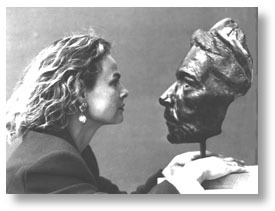 About me: Welcome to the timeless yet contemporary world of sculpture.... Sculpture is my passion! I'm 58 years old (born in Paris in 1954) - and see myself first as a sculptor and second as a person who has lived a full life: former dancer, former translator, designer and sculpture teacher, but also mother, dog lover, poet, occasional photographer, songwriter, web designer, co-organizer for many years of an international annual Festival, concerned "world citizen" who worked on a number of community art projects such as the Arte Para Todos project organised by the United Nations of Honduras, or the Vale of Belvoir Arts Projects including the 3Rs: Reclaimed, Recycled, Raw Sculpture Trail. A bit of a puzzle to some perhaps (accent-wise) in that I grew up as a world citizen (first few months in France, then 6 years in the US, then back to France for 11 years, then back in the US for 8 years, then back to France for 3 years, then England for the last 24 years... with forays to Montana for a bit, and to many other places throughout). My mother was Dutch (raised in Indonesia), my father is French (born in Japan and raised in Greece). Both of their backgrounds influenced my life and my education - academic and otherwise - tremendously. While you can see samples of existing sculptures I have for sale (original and limited edition work) as well as previous commissions elsewhere in this site by clicking on headings below, in this page I've concentrated on presenting my curriculum vitae (or resumé) and on explaining what makes me tick, the projects I'm working on, etc. International Sculpture Symposium, Hue Vietnam 2004, along the bank of the Perfume River in the ancient imperial city of Hue - click here for pic of "Maze of Love & Friendship" or here for "Boat People" steel sculpture. Future Hope in HSBC London Headquarters 2005 - a group exhibition and auction in April 2005, in the Canary Wharf HSBC building, to benefit Future Hope, an Indian foundation helping children in Calcutta. 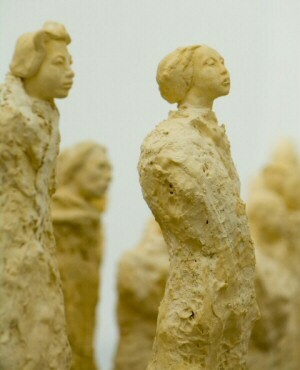 1st International Sculpture Festival of Kunming, 2005. Click here for pics of "Tsunami Memorial" in concrete and bronze. "Art & Soul" - group exhibition with approx. 30 other artists in each edition, along with Anthony Gormley in 2006 and Damien Hirst in 2007, in support of Demelza (Hospice Care for Children) Rhapsody House Gallery, Pantiles, Tunbridge Wells, Kent, October 2006 and 2007. The Tennis Terracotta Warrior project for the ATP / Tennis Master Cup of Shanghai was definitely a highlight for me. Every single commission for collectors / clients is thrilling, but I have to say that I am proudest of my Artists of the Silk Road sculpture series which was created the context of a Masters of Fine Art International Practice degree course completed in Sept. 2006 at the University College of the Arts at Canterbury in Kent (England). Artist-in-Residence Belvoir Castle & Estate: Just a flavour of it.... Arrived in September 2010, and started to feel my way around the Vale of Belvoir in the Leicestershire / Lincolnshire (East Midlands). Had the privilege of several lunches with the Duke and Duchess of Rutland whose ancient home this is. The studio on the Estate was first set up at the Old Hunt Stables in Woolsthorpe-by-Belvoir - and has now moved to Knipton Lodge Cottage in Knipton. See art residency home page here. Also in this context I also have a new Wordpress blog: http://belvoirartist.wordpress.com/ which you may find interesting. Click on the image above for info about the "Belvoir 3Rs" Reclaimed, Recycled, Raw Sculpture Trail, which resulted from a national sculpture competition and a sculpture symposium held during Easter 2011. Crown of the Continent Sculpture Trail: With the first sculpture up in Seeley Lake completed and unveiled on 3 September 2010 - see "Log Henge: Spirits of the Forest" - I am looking to raise funds in Montana to get the second sculpture up on the trail, hopefully an equestrian sculpture by fellow Alpine Artisan friend and artist Merrily Dunham, or a huge basket sculpture by Jennifer Dyer. Rustic Artistic: Designs of rustic furniture and accessories in partnership with my husband Joe Caneen. See example below and more examples here. China - 2001-2011: Projects in China following the successful China Changchun International Sculpture Symposium included attending the International Sculpture Convention 2003 as the leader of the European Delegation of sculptors who had taken part in the past. See also the large-scale outdoor sculpture created at the 1st International Sculpture Festival of Kunming, China 2005, entitled "Tsunami Memorial". See a few sculpture design ideas here - these are awaiting a generous collector's fancy or an urban commission and show the direction some of my work is taking! "20 Heads of the Year 2000" - this may turn into 2020 or even 2030!!!! Completed "Heads": John Travolta, Isaac Hayes and Chick Corea, all three of which sat for their sculpture portraits. Anyone interested in helping establish contact with other inspiring figures, please e-mail me. Masters of Fine Art International Practice degree course: Started this in October 2004 and graduated in September 2006. Click here to visit the MFA section. 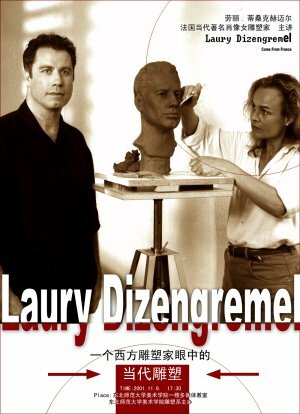 During the WINTER (2001-2002) I was invited to do a lecture tour in China as a professional sculptor (the poster on the left was designed by Jian Dian Kun, head of the computer design team for North East Normal University in Changchun, Jilin Province, China). I lectured in Changchun (Jilin Province), Harbin (Heilongjiang Province) and Dalian (Liaoning Province) to the fine art and design students of 4 different universities. Also delivered further lectures in Chongqing (formerly Sichuan Province) in 2004-2005 and Kunming (Yunnan Province) in 2005. Also in Chongqing again in 2007, 2009, 2010 and 2011. I started teaching a very small selection of pupils from Greenfields School in Sussex at GCSE and A level back in 1995 in my own studio. Since then I've taken 2 to 4 students almost every year for at least one term through a sculpture module for their A levels, again in my own studio. I've also taught a one-week summer workshop at Greenfields with students aged 10 to 70, besides conducting lots of other workshops around the world. I'm always happy to give sculpture instruction to new people, friends or scupture students when asked. Teaching opened up a whole new realm of understanding of sculpture for me and I love it. I am confident I can teach anyone the basics of portrait or figure sculpture, and the basics of 3D artwork and always welcome questions or enquiries. To the left is the second sculpture ever produced by one of my students, Clemency Scarfe-Beckett, now a prominent designer. In more recent times I've taught sculpture workshops in Somerset, Lincolnshire and Leicestershire in both primary schools and secondary schools. - Finding many of the spiritual and practical every-day-life answers I sought in the works of philosophers, such as Cicero, L. Ron Hubbard and Ken Wilber. - Finally having the homebirth I'd always wanted: the result was Chloë or warmth, laughter and talent personified. She's now in her second year at Oxford University! - Seeing the pour for my first pieceof sculpture being cast in bronze... the incandescent light, the heat! - Singing in public for the first time thanks to the insistence of singer Gloria Rusch. Thank you! Actually, there are so many milestones. Sometimes it also feels like there have been different lives within this lifetime already (living in so many different places, each with its own set of friends and aquaintances, and yet retaining the continuity of people I've known throughout). If you want to know more about me, see my monumental sculptures or sculptures available now and some previous portrait and bust commissions, including Isaac Hayes, Chick Corea and John Travolta (for charity). Also read some of my poetry if poetry is your thing. And if you're after a romantic 8th Wedding Anniversary or 19th Wedding Anniversary gift with the appropriate bronze theme - click here.